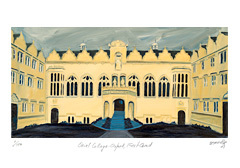 The college was founded by Edward II in 1324 and was probably named after one of the original houses on the site –Le Oriele. The full name of the college is The House of Blessed Mary the Virgin in Oxford commonly called Oriel College. 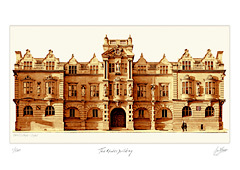 In 1902 St Mary College, which fronts onto The High, was merged with Oriel College linking the two buildings together. Nothing now remains of the original buildings. The residential ranges facing Oriel Square are of three storeys with double curved gables in the Flemish style. The main entrance to the college is through the Gate Tower which has finely carved doors and a battlemented parapet. The 18th century houses in Oriel Square are used for accommodation.